Note: This article was originally posted on June 30, 2017. It has been updated for 2018 to reflect changes and observations of the platform since its rollout. After a year of taunting and beta testing with larger brands, Google moved Posts into their Google My Business (GMB) platform, opening it up to millions of small businesses. Google Posts appear in the knowledge box directly below the details for your company, offering up space for businesses to highlight special deals and events, top products or key services, all within the GMB listing. Google even offers options for reservations, newsletter signup, latest offers, making a purchase, or learning more. While Google says using Posts is a way to connect with customers directly, we view it as an opportunity to direct an individual straight to the most current news, latest promotions, or other information relevant to your brand. For instance, you can highlight and link directly to promos, recent blog content, services, and in-store events, rotating as necessary to match your overall marketing goals. 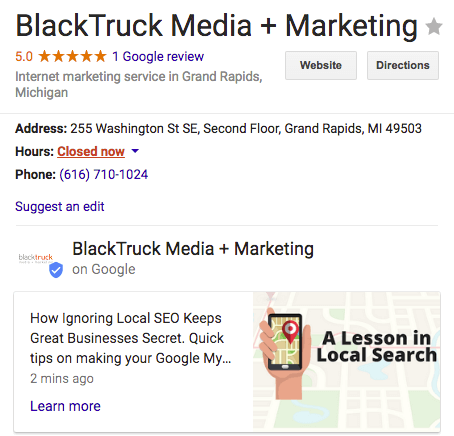 Posts are a great way to leverage your Google My Business listing to not only capture the attention of those performing local searches, but to also attract additional organic search traffic to your website and foot traffic to your business location (posts also show up with your listing in Maps). If you use this platform to direct searchers to your website, we recommend using tracking URLs so you can easily see in Google Analytics the kind of traffic that comes from individual announcements. Google Posts allow for up to 300 words of text written in a social media style format, accompanied by a photo or image. Though the image is optional, we highly recommend you use one to help your message stand out. Google Posts is very much a hybrid platform, blurring the lines between social media, local search, and most certainly content marketing. In the future, this could even mean another channel for Google to monetize. Don’t let the small business moniker of Google My Business fool you; major brands and corporations should be taking advantage of Posts, as well. Restaurants – While reservations and offers are an obvious choice for restaurants, don’t limit yourself. Use this space to highlight your menu, or perhaps that Best Happy Hour award you just won. Entertainment – From theatres to entertainment venues, using Google Posts to help promote the latest event at your location is a great feature. Get creative here and use the Reservations or Get Offer call-to-action to deliver a sense of urgency. Retailers & Specialty Stores – Offers and deals are an obvious choice here, as well, but why not schedule an Event for your next in-store promo event? Speciality retailers take note; this is the time you promote your feature on “______ Trends for 2018.” Put your content to work in ways you didn’t think before. B2C Service Companies – From local beauty salons to cleaning services, we could think of a hundred ways Google Posts can be used for service companies. Perhaps it’s an offer for first-time customers, or you’re a local thought leader on environmentally friendly cleaning methods; it’s time to feature that content here just as you would on Facebook. B2B Product & Service Companies – As with any B2B product or service, market to the human who’s doing the search, not the company. Create messages that are the most relevant to the core of your brand and what you do. Individuals seeking your brand have been referred to you, or they know of you already; remind them why. Non-profits – This is another opportunity to tell your story. 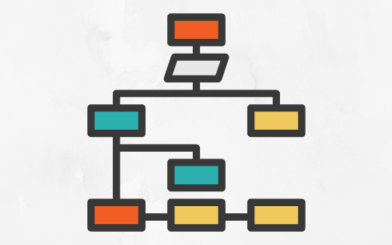 An individual is searching for your organization to begin with, so the likelihood of them knowing you is much higher. Get your message out there and gain a few more volunteers or donors. Images are an optional feature that can help your announcement stand out. Here are some quick tips on formatting for the optimal outcome. Google will ask you to crop your image or photo for Posts. Though the process of creating a post is fairly intuitive, Google is not upfront in the process about the size your image should be. But don’t worry; we figured it out for you. Google recommends a minimum resolution of 720px wide by 540px tall, in JPG or PNG format. If you’re using an image that has different dimensions, and there is text in your image, make sure the feature, title, or callout fits in an area within the crop window. Our initial research and testing of Google Posts show they publish fairly instantaneously or within a couple of minutes. 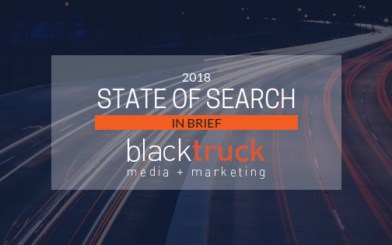 They appear much faster on mobile devices, which is not shocking considering the large percentage of local searches that are performed on mobile. This plays directly into Google’s push for Local Mobile Search (or is it “Mobile Local”?). We’ve also definitely gotten some direct traffic to our website through our test posts. Mike Blumenthal also wrote on Google Posts, sharing that they disappear from the knowledge panel 7 days after being published (which we found to be the case for our test), and that posts designated as “Events” will display for the duration of the event. We found that clicking or tapping on a live post (not the call-to-action) will display a full history of your posts beyond 7 days. If desired, you can delete old or irrelevant ones through your Google My Business manager. Blumenthal also noted that up to 10 recent posts will display in a carousel format in the knowledge panel. Individual posts can be shared from the mobile or desktop interface to social media or email, offering a quick way to share timely info with others. Have you tried out Google Posts as a business? Have you seen them “in the wild” in your recent Google searches? Let us know what you think!